In the mid-1960’s, Wallace Berman inspired and communed with a close-knit circle of actors and artists, who screened their underground films domestically among a group of Topanga Canyon bohemians. 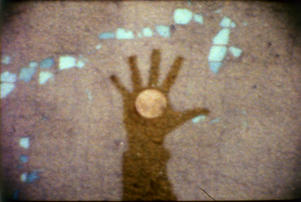 These films were influenced by Berman’s spiritualist and radically amateur concepts of art, that nevertheless thrived in the intersection among art, Hollywood, and the institutions of the semi-commercial underground. Among this expanded circle in Topanga were Dennis Hopper, Russ Tamblyn, Toni Basil, Dean Stockwell, George Herms, Bruce Conner, and Robert Alexander. The evening will include several films made by the artists in this community, along with a conversation among the guests, and perhaps a performance. Speaking in Tongues: The Art of Wallace Berman and Robert Heinecken, 1961-1976, which will be open that evening before the screening. Come early to check out the wonderful exhibit! "The camera captures her movements in gestural, expressive light smears. Intercut rhythmically with strophes of black leader, she gyrates in graceful, stroboscopic accelerations. Conner's editing is consummate as he alternates angles of her figure from different shots into a kinesthetic, flowing continuity. A dance film viewed twice (once forward, once backward) in five minutes. 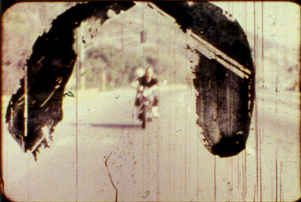 The film was shot at single frame exposures as well as 8, 16, 24 and 36 frames per second. A fast –paced view of the times and activities of Russ Tamblyn, largely edited in camera. Glimpses of scenic locales, artistic possibilities, people on the move, and the full gamut of filmic manipulations. Similar in style to First Film, Tamblyn filmed a journey to Rio. This selection of ethereal home movies shot in and around Topanga Canyon paints a rich portrait of Los Angeles as it once was…. This show will repeat at Ceinfamily on Saturday January 7, 2012!